The seven-phased Lok Sabha Elections 2019 began on April 11, and the voting for the second phase of LS Elections 2019 will take place on April 18. The campaigning for the phase has ended on April 16, and it will all boil down to how the voters vote on Thursday. A total of 1,644 candidates are contesting in the Lok Sabha Phase II. Lok Sabha Elections 2019 Schedule: Voting In 7 Phases From April 11 to May 19, Counting And Results On May 23; Check All Dates For General Elections. An interesting analysis says 27% or 427 candidates have declared their assets over Rs 1 crore. The major parties in the fray are Bharatiya Janata Party (BJP), Indian National Congress (INC), Dravida Munnetra Kazhagam (DMK), All India Anna Dravida Munnetra Kazhagam (AIADMK), Bahujan Samaj Party (BSP), and All India Trinamool Congress (AITC) among others. Lok Sabha Elections 2019: Campaigning for Phase 2 Ends, Polling on 95 Seats to Be Held on April 18. 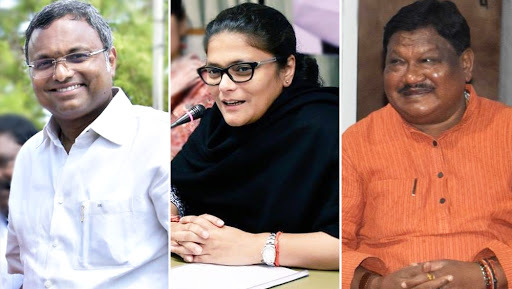 As the clock ticks away for the second phase of Elections 2019, we take a look at the key battles that will take place on April 18. In 2019 Elections, with DMK-Congress, and BJP-AIADMK sealing alliances, the electoral fight will be between Congress and the BJP. On one hand is Karti Chidambaram, son of former Finance Minister P Chidambaram; whereas, on the hand is the national secretary of BJP, H Raja. The constituency has over 14 lakh voters and covers six Assembly segments. Out of the 39 seats in Tamil Nadu, the battle for Sivaganga is a prestigious one for both UPA and NDA alliances. The constituency of Sivaganga has been a bastion of Congress for a long time. However, an AIADMK candidate won the seat in the 2014 Lok Sabha Elections, where BJP and Congress ended up on the second and third spot. The constituency of Sundragarh, Odisha will witness a three-cornered fight in 2019 General Elections. Jual Oram is a sitting MP from the constituency, who will take on Sunita Biswal – daughter of former CM Hemananda Biswal, and George Tirkey – senior Congress leader and a four-time MLA. BJP’s Jual Oram has won four times from the seat, starting his run from 1998. Barring a loss in 2009, where Hemananda Biswal defeated Oram, the latter has won the seat in 1998, 1999, 2004, and 2014. The parliamentary constituency covers seven Assembly seats. Odisha has a total of 21 Lok Sabha seats and Sundargarh is the sole constituency where the BJP won in 2014 Lok Sabha Elections. Speaking about 2019, the battle of Sundargarh is likely to have a photo finish, given how strong chances of the candidates are and how the political dynamics have changed in the last five years. In 2019 Elections, the battle of Silchar, Assam will witness a close fight between Congress’ Sushmita Dev and BJP’s Rajdeep Roy. Other candidates in the fray are TMC’s Hitabrata Roy, and SUCI-C’s Shyam Deo Kurmi. It is considered as one of the most important seats in the northeastern region, given how the socio-economic affairs have changed in the state. The issue of Citizenship Amendment Bill (CAB) will be at the core of issues heading into the upcoming elections. PM Narendra Modi has visited the constituency twice already, Congress President Rahul Gandhi has paid a visit and so has Priyanka Gandhi Vadra. Given by the looks of how the political stars. Despite a strong Modi wave in 2014, it was Sushmita Dev of Congress who defeated BJP’s Kabindra Purkayastha by a margin of over 30,000 votes. In 2009, it was BJP’s Kabindra Purkayastha who had emerged victorious. With less than 24 hours to go in the second phase of Lok Sabha Elections, it will be interesting to see which political the electorate votes. With 97 seats across 13 states and UTs set to go polling on April 18, the race to the 17th Lok Sabha has only intensified. People in Puducherry, Chhattisgarh, Bihar, Odisha, Manipur, Karnataka, Tripura, Assam, Uttar Pradesh, West Bengal, Jammu and Kashmir, Maharashtra and Tamil Nadu will be exercising their right to vote today. The seven-phased 2019 Lok Sabha Elections will end on May 19, for which the results will be announced on May 23. Stay tuned to LatestLY for all the latest news and updates for Lok Sabha Elections 2019.